Dental implants are the best option for replacing a tooth. Nothing gives you longer-lasting results while protecting the bones in your jaw from deterioration. 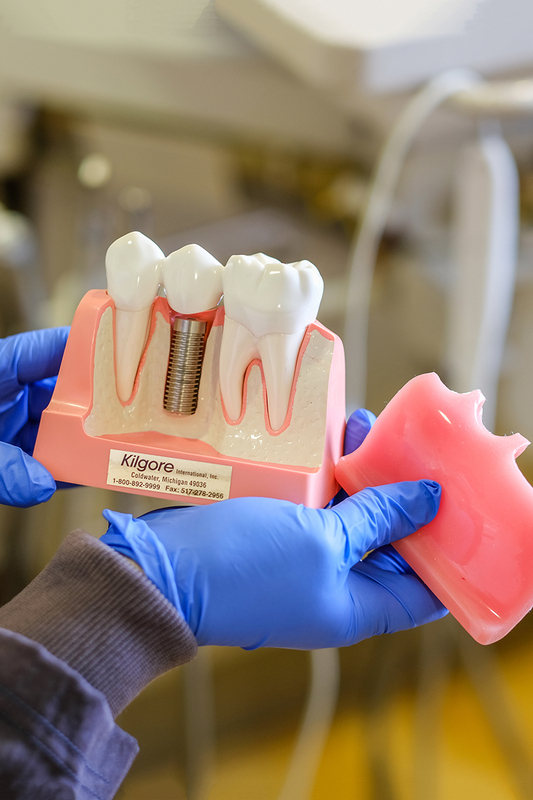 For a dental implant, Dr. Nicole M. Paxson uses a small, screw-shaped titanium post that replaces the root of the missing tooth. Placing the screw is a minor, routine surgical procedure. In most cases, you will only need local anesthesia for the procedure. After a brief healing period, the implant is topped with a lifelike crown custom-made to match your existing natural teeth. Implants have a documented success rate of over 95%, which is significantly higher than any other tooth-replacement option. When you are missing only one tooth, Dr. Paxson can insert a single implant into the bone. A crown then goes on top to simulate an actual tooth. This treatment choice has the highest success rate, making it the best long-term investment for replacing a single missing tooth. Even if the initial cost is slightly higher than other options, it is the most cost-effective solution over time. An implant will never decay or need root canal treatment, and feels just like your natural tooth. When you are missing more than one tooth, implants are ideal. Dental implant teeth can act as supports for fixed bridgework. For example, if you are missing three teeth in a row, we can place one implant on either side of the gap. The crown in between doesn’t need an implant underneath. That reduces the stress on your natural teeth. Implants can support an entire arch of upper or lower replacement teeth that are fixed in the mouth and never removed. Sometimes the new teeth can be supported by as few as 4 implants. In cases where the jawbone has deteriorated, 5 or 6 implants might be needed to support a row of 10 to 12 teeth. Dental implant replacement teeth protect your jawbone, won’t slip, and should last a lifetime. Implants can even make removable dentures more comfortable, effective and healthier to wear. Traditional dentures rest on the gums and put pressure on the underlying bone. This accelerates bone loss so that the jaw shrinks and the dentures slip, particularly on the bottom. But today, dentists can attach removable dentures onto implants, transferring that pressure into the bone structure rather than the bone surface. This prevents the dentures from slipping while you eat and speak, and preserves the bone directly beneath them. There are only two ways an implant can lose attachment to the bone and fail once it has successfully fused: poor oral hygiene or excessive biting forces. Poor oral hygiene and/or a lack of regular cleanings can lead to a destructive bacterial infection called peri-implantitis. Flossing and brushing your teeth on a daily basis, along with regular professional cleanings, can prevent this. Excessive biting forces can come from either a habit of clenching or grinding your teeth. If you have a habit of grinding or clenching your teeth, Dr. Paxson will recommend a nightguard to protect your implants.